This recipe just didn't quite do it for us, although it certainly was easy. I cooked a batch of rice and while that was simmering, I mixed the spices with the syrup. While the fish was cooking, I tossed a spring greens salad with balsamic vinaigrette, which was an excellent complement to the rice and the heat of the fish. Bust the fish wasn't the star it should have been. 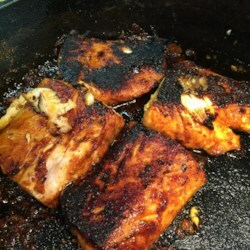 It was my fist time cooking Mahi Mahi and it seemed a bit bland, despite the Cajun spice. I will give it another try with different fish and see how that works for us. Thanks for sharing the recipe.